Turkish President Recep Tayyip Erdoğan declared victory in elections on Sunday, citing what he said was a public mandate for him and the alliance led by his ruling Justice and Development (AK) Party. Erdoğan said there would be no turning back from where he and the AK Party had brought the economy. "Our people have given us the job of carrying out the presidential and executive posts," he said in a short speech from Istanbul. 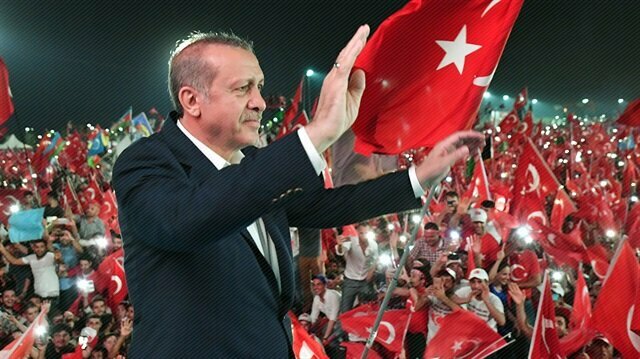 Supporters of Turkish President Recep Tayyip Erdoğan and his Justice and Development (AK) Party celebrated presidential and parliamentary election victory across the nation. "I hope nobody will try to cast a shadow on the results and harm democracy in order to hide their own failure." The president said it was time to focus on Turkey's future by leaving behind the tensions of the election period. "Our determination to continue on improving rights and freedoms will continue. We will continue to respond to those who threaten us via terror organizations," Erdoğan said. “The unofficial results of the elections have been revealed. The Turkish public has mandated me as president, and has granted the parliamentary majority to the People’s Alliance,” he added. Erdoğan also hailed efforts to keep Turkey's ballot boxes secure. “Ballot box security and the freedom to vote is an expression of Turkish democracy’s strength. Turkey has given the whole world a lesson in democracy with a voter turnout of almost 90 percent," he said.